The sculptural installation has been unveiled at the Australian Garden at the Royal Botanic Gardens Cranbourne to commemorate Landscape Architect’s Kevin Taylor’s significant contribution to its genesis and fruition. 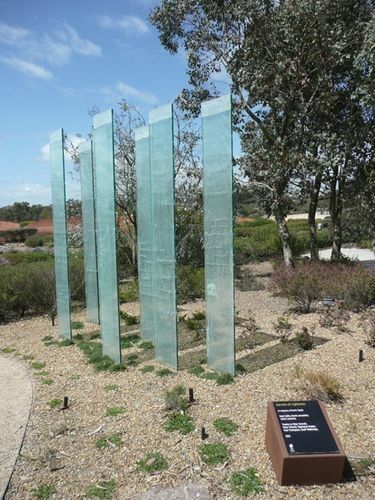 Designed by internationally renowned artist Janet Laurence in collaboration with David Lancashire and Kate Cullity “Secrets of Lightness” is a sculptural installation of seven glass panels etched with Kevin’s handwritten prose on the Australian landscape. The sculptural installation was proposed by former Director and Chief Executive of the Royal Botanic Gardens, Dr Phillip Moors and has been installed in one of Kevin’s favourite areas within the ‘Eucalypt Walk “ of the Australian Gardens. Landscape architect and urban designer Kevin Taylor died tragically in a car collision near Darwin on the morning of Sunday, 7 August 2011. The crash also claimed the lives of Lena Yali and Greg McNamara from Troppo Architects. Kevin, a talented and unpretentious designer, established one of Australia’s most awarded practices, Taylor Cullity Lethlean, together with Kate Cullity and Perry Lethlean. In 1990, Kevin and his partner Kate formed Kevin Taylor and Kate Cullity Pty Ltd, producing the highly awarded and flamboyant Box Hill Community Arts Centre with architect Greg Burgess, and developing the much-publicized Australian Garden at the Royal Botanic Gardens, Melbourne with Paul Thompson. In July 2012, Kevin was posthumously awarded the Sir James Irwin President’s medal at the South Australian Institute of Architects Awards in recognition of his exemplary contribution to design.